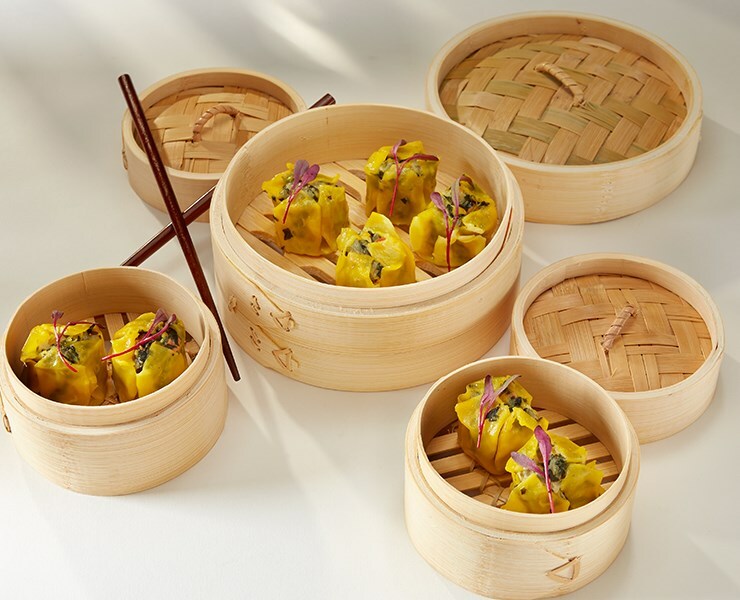 Classic Chinese Dim Sum consisting of Vermicelli pasta and a vibrant garden mix of spinach, peas, carrots, and corn; placed in a dumpling wrapper, and topped with a fresh pea. From frozen must be STEAMED in a steamer for 6-8 minutes or DEEP FRIED at 350°F for 4- 6 minutes until internal temperature reaches 165°F as measured by use of a thermometer. •Classic Dim Sum. Provides open top fold and color. •Versatile preparation; steam or fry. •Pairs well with variety of sauces: Ponzu, Sriracha, Hoison, Chili Oil. •Component to various Asian-inspired soups. •Two Options: K3006 Vegetable Shaomai and K3007 Chicken Shaomai. •Meets Vegetarian dietary requirements (K3006 Vegetable Shaomai Only). Mini chicken marsala pot pie. Hand crafted by Kabobs. Perfect hors d'oeuvre / appetizer as-is, or pairs nicely with mushroom cream sauce. Classic Chinese Dim Sum consisting of a savory mix of chicken, marinated in sesame oil and soy sauce, placed in a dumpling wrapper, and topped with a corn kernel. A traditional Spanish inspired delicacy, consisting of diced calamari, shrimp, Palacio chorizo, simmered in crushed tomatoes, pimentos, olive oil, and chardonnay, stuffed in a saffron rice blend of fresh peas, and parmesan cheese, dusted with panko bread crumbs. Blend of cream cheese, Monterey Jack cheese, and pickled jalapeno peppers, place in an arepa flour pastry. Great pan seared or fried.